August 23, 2017 -- The City of Houston’s Civic Art Program has completed installation of ten new solar-powered parking meters along Allen Parkway that have been enlivened with artwork by Celan Bouillet. Located between downtown and Taft Street, alongside Buffalo Bayou Park, the parking meters transform once-muted objects into art pieces that all Houstonians can enjoy. Celan Bouillet was selected through an open call for creative ideas from local artists for the ten parking meters. For her proposal, Bouillet was inspired by travel, textiles and the location of the meters. 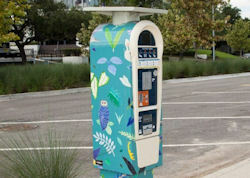 “My designs for the parking meters incorporate natural elements from the Buffalo Bayou Park—plants, animals, and rocks—into patterns resembling contemporary tapestries,” stated Bouillet. “The Garden Tapestries explores our relationship with Houston's green spaces and gardens.” Bouillet’s paintings were printed on vinyl and wrapped around the meters. Bouillet received her BA in English and BFA in Painting from the University of Georgia in 2008 and her MFA from the Maryland Institute College of Art in 2013. She has received numerous awards and honors including: 2013 Full Fellowship recipient to Vermont Studio Center, 2014 Artist-in-residence at Houston Community College SE, 2014 Best in Show at Lawndale's Big Show, 2014 Best in Show at Gallery 500x EXPO, and 2015 Emerging Artist Grant through Houston Arts Alliance. The city previously commissioned art parking meters in the Warehouse District and Washington Avenue. 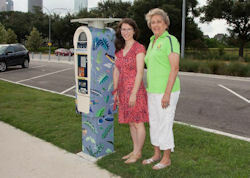 The latest Art Parking Meter project is made possible by the City of Houston General Services, ParkHouston and Mayor Pro Tem Ellen Cohen. The Houston Arts Alliance administered the artist selection process, fabrication of the artwork and installation. The Civic Art Program is managed by the Mayor's Office of Cultural Affairs. For more information about the City’s Cultural Programs go to www.houstontx.gov/culturalaffairs or follow the Mayor’s Office of Cultural Affairs on Facebook @HoustonMOCA.